Ryo Agarie of Nyamyam’s Tengami game is celebrated for his refined use of Japanese aesthetics. And…he is an ardent supporter of PooPride! Chinese gaming media brought together Agarie x Poopman/Akihiko Koseki for a showdown of aesthetic sensibilities, and a celebration of the creativity at the heart of indies gaming! The media event was produced by China-based Hiro Productions, one of PooPride’s most passionate supporters. Agarie recounted how PooPride initially made him want to puke. But, Poopman turned him around! Getting comfortable with your poop is good for your health. Your poop tells you about the well being of your bowels, which as it turns out are intimately linked with the nervous system – to the point of being called the body’s “second brain”! Plus, taking a good look at your daily poop can clue you into potentially serious problems…like colon cancer! And, Agarie and Poopman grieved together over the recent passing of Nintendo’s pioneering head Satoru Iwata. Poopman/Koseki was blessed with the chance to work with Iwata-san on games like SimCity 64. Like developers everywhere, Agarie and Koseki reflected upon Iwata-san’s career and drew inspiration from his example. Our most sincere condolences to those closest to Mr. Iwata. 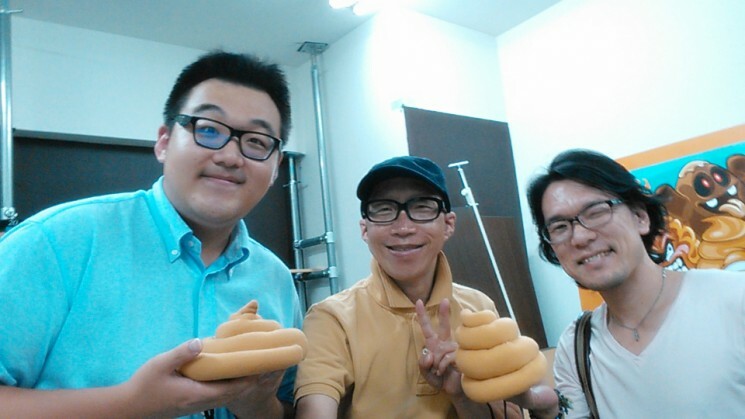 Next Post Crappy Conga Line and Poop Policing in Asakusa!